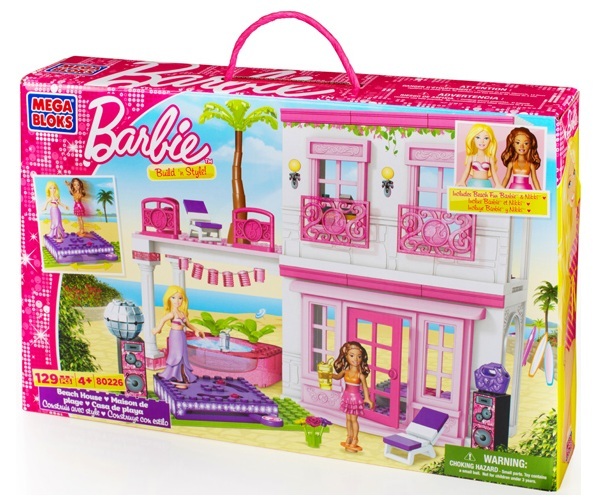 Product Detail Summary: It’s time for Beach Fun Barbie® to take a super fun vacation at the Mega Bloks Barbie® Build ‘n Style Beach House! Let the beach party begin! Turn up the music and Beach Fun Barbie® and Nikki® mini-fashion figures really spin on the whirl-and-twirl dance floor! There’s even a hot tub that can really hold water! Show your summer style and fun at this fabulous beach house! Includes Beach Fun Barbie® and Nikki® mini-fashion figures with changeable outfits! Combine with all of the Mega Bloks Barbie® playsets to build a fabulous world of fashion, friends and fun!